I baked my cake just yesterday & I have this feeling that it will be wonderfully delicious when I slice & serve it at Christmas!! This lovely & moist fruit cake has rum. You may use brandy if you like. I do not like to use candied peels & tutti frutti as I am not fond of it. I like my fruit cake pleasantly moist, sweet, nutty & fruity. This cake is just the way I like it. I baked 3 small cakes from the recipe mentioned below. I prefer smaller cakes as they require less time to bake & are easier to unwrap & slice. We love this fruit cake with dry fruits, nuts, the subtle flavor of rum & the refreshing aroma of mixed spice. My home was filled with the sweet aroma of baking.. eagerly awaiting Christmas Day!! 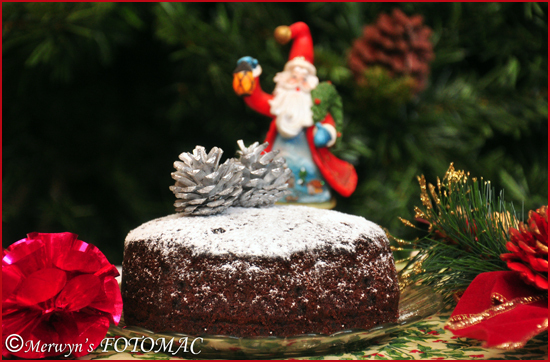 Enjoy & relish this Easy Rich Fruit Cake.. Merry Christmas to all the visitors of my blog! 100 gms. each of seedless raisins, sultanas & currants; 50 gms. each of pitted prunes, cherries/cranberries, dry apricots & cashew nuts. You may use any combination of dry fruits you like. I am not very fond of candied peels or tutti frutti but you may use it if you like it. Use a dry tea towel to rub clean the raisins, sultanas & currants. Remove stalks if any. Cut,wash & dry the candied cherries. Chop all the dry fruits roughly &the; cashewnuts finely. Combine ¼ tsp. each of fresh clove, cinnamon & nutmeg pwd. or combine spices according to your preference. In a sufficiently large bowl, mix all the above mentioned ingredients together & let it soak for 24 hrs. You may even soak it for a month or a year in advance depending on your preference. Heat one cup of granulated sugar with few drops of water on a low flame. The liquid will start frothing & the color will start changing gradually to light brown. Keep stirring gradually till the color changes to a deep brown. Do not burn or your cake will taste bitter. Take off heat & let the froth subside a little, then gradually & gently add ¾ cup of hot water, stir & put it back on the flame. Cook till the caramel liquefies. Be very careful or the caramel may splatter. Caramel is easily available in grocery stores & supermarkets in case you do not wish to prepare your own. 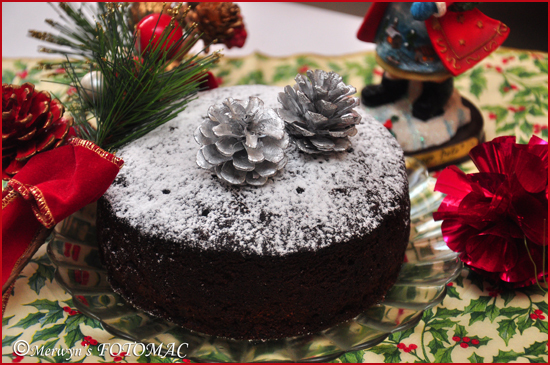 It is the caramel which gives a deep dark color to the rich fruit cake! Grease & double line two 8 inch round baking pans at the bottom. Also line the sides, extending about 2 inches above the pans. You may use a non-stick parchment baking paper/butter paper/non-stick vegetable spray. All ingredients should be at room temperature. Pre-heat oven at 160C. Sift flour & baking powder with a sieve. Add a pinch of salt & finely ground almonds & mix well. Keep aside to use later. In a sufficiently large bowl, beat the butter till soft using a spatula/electric hand blender/blender with a stand. Cream butter & sugar till light & fluffy. Scrape down the bowl from time to time. Pour in the milk & caramel; mix well. Fold in the flour a few tbsps. at a time till all the flour is incorporated. Add in the soaked fruits & fold gently with a wooden spatula or spoon. Do not over mix. Fill the pans equally with the batter & spread it evenly. Tap the pan gently so as to release the air bubbles if any. Make a slight depression in the center with the back of a spoon. This will ensure that the cake bakes evenly at the top. Bake in a pre-heated oven at 160C for about an hour. Reduce the temperature to 150C & continue to bake for1 hour & 30 mins or until a long wooden skewer comes out clean with just a few moist crumbs. If the cake is browning too quickly then cover the top with a double thickness of paper. Remove the fruit cake from the oven & place on a wire rack to cool completely. Using a skewer poke holes through the cake at intervals & pour rum all over the cake. Remove the paper lining & wrap the cake thoroughly in cling film/plastic wrap/aluminium foil & place in an airtight container/tin/box. Brush the cake periodically (once or twice a week) with rum until Christmas. This cake will keep several weeks or it can be frozen. got some readymade caramel from arife…. super excited…thank u so muchhhh..!!! I tried the recipe and the cake came out perfect. I am an amateur baker so super excited with the outcome. I tried this cake, it turned out awesome! Just one question, does the cake have to be refrigerated? Baked the cake yesterday, pored brandy, cling wrapped them and put them in air tight containers. 2werks to go for Christmas, so just wanted to know if it is advisable to refrigerate it. I am in dubai, it’s quite cold during December here.